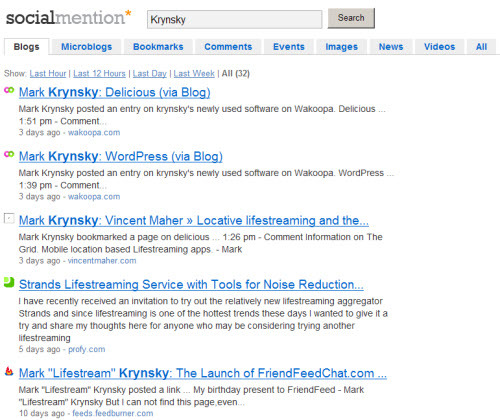 SocialMention.com is a newly released project built using Yahoo’s BOSS search platform . It was created by Jon Cianciullo who also created cluztr.com which I’ve written about previously. It’s basically a search engine that allows you to search for people, or mentions of them, as well as any other keyword and get results from top social media sites including Twitter, FriendFeed, Delicious , Flickr, Digg, YouTube, coComment and more. So let’s say you have friends that may use one or more social media services and you wanted to scour the web to find out everywhere they are either creating, or being mentioned across those services, this is your tool. You can get the whole enchilada in what merged feed, or you can filter by types of services (i.e. Microblogs, bookmarks, videos, etc…) using tabs. In addition to web-based search results, Social Mention also plans on adding email alerts and personalized RSS feeds as features in the near future to provide automatic and instant updates. This is definitely a tool you should add to your social media arsenal.